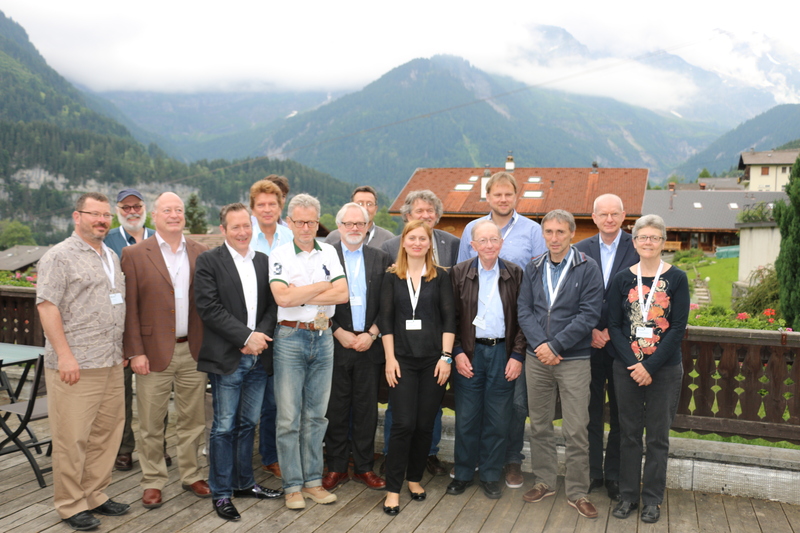 A few of our Frontiers Field and Specialty Chief Editors: Sam Finn, Joav Merrick, Rod Kuljiš, Axel Cleeremans, Henry Markram (co-founder and Editor-in-Chief of Frontiers), Johannes le Coutre, Jeff Holly, Alex Hansen, Carlos Duarte, Kamila Markram (CEO and co-founder of Frontiers), Martin Klotz, Theo Godfraind, Hauke Heekeren, Egidio D’Angelo, Ferdinand Köckerling and Mary Christopher in Champéry, Switzerland. Combining all its journals, Frontiers supports one of the largest groups of editors in the world of academic publishing, with more than 63,000 board members, enabling them to facilitate the publication of most recent advances in knowledge and research methods in their fields. But why do top scientists and scholars join a Frontiers’ editorial board? One of the many reasons members of the research community have joined Frontiers is because they agree with our vision that oversight and quality control of the scholarly literature should be vested squarely in the research community itself and, in particular, involve active scientists and scholars at all levels. The final decision on what is and what is not published will be exclusively made by the academic handling editor of the manuscript based on the expert advice of their fellow editorial board members. Our publishing model is explained in more detail here. “I’ve been with Frontiers since 2008. The most rewarding aspect has been seeing how the journal has taken off as it has. There is a big community around Frontiers in Psychology now and it is very active. Personally, to be part of the development of all of this and to play a significant role in developing the journal has been rewarding,” said Prof. Axel Cleeremans, Field Chief Editor for Frontiers in Psychology. As Cleeremans mentioned, another reason so many of our editors have stayed with us since the launch of their journals is because as Chief Editor or Associate Editor you have the unique opportunity to build a community around the journal by identifying people to lead specialty sections and Research Topics, and by adding members to the editorial board that you feel would make the best contributions. As a Frontiers editor, you are also invested with a greater degree of editorial control through the Frontiers review process itself. Our innovative Collaborative Peer Review is conducted across an online forum operating in real-time, and facilitates an unprecedented level of discussion and correspondence between editors and authors. “What I really like is mentoring and interacting with people… trying to help them and point out avenues and opportunities. I see this in action for every manuscript submitted [to Frontiers] and how it is being processed. There is a true value-adding process happening where the product at the end is always measurably better than the initial submission,” said Prof. Martin Klotz, Field Chief Editor of Frontiers in Microbiology. Frontiers is one of the only open access publishers in the world with a customized publishing platform that was built specifically for peer review. Built in-house by the Frontiers technology team, our peer review tools were designed to enable communication between everyone involved in the review, and to promote real-time interaction and engagement. Because of the seamless interactivity throughout the review process, all editors from the Specialty Chief Editor to the Review Editors are able to convey concerns and lay out criticisms they might have about work that has been submitted for publication. This also means that as an editor, you are an active part in the process of advancing the standards your research community has set for itself. Transparency is important to all our editors. This is why everyone who reviews a paper that is accepted for publication in a Frontiers journal, is recognized for their work on the final product: the editor’s and reviewers’ names are included with the published article. This is something that isn’t available in most other journals. Read more about how the Collaborative Peer Review process works here. “When you review for traditional journal publications, there is no record of your effort and contribution and there is no connection between your expertise and advances in individual projects and specialties. You might have actually helped creating a better product and in Frontiers it is obvious that you have made a contribution; this is also a helpful tool for administrators to evaluate the professional engagement of beginning investigators,” Klotz explained. This recognition and transparency changes the dynamics of interaction between the authors and reviewers as everyone is focused on making the paper the best it can be. Dr. Ferdinand Köckerling, Field Chief Editor of Frontiers in Surgery, says witnessing the transformation of the paper from the beginning to the end is one of the most rewarding parts for him as an editor. “My personal opinion is that the role of the reviewer is more to help the authors to become better in their publication and not restricting publications,” he said. It’s being an integral part of your scientific community, being able to shape the research that is being done and being on the cutting edge of the latest advancements of your field that are the true rewards. “The most exciting aspect is the building of something new. Then there are the other advantages of being an editor such as maintaining a good knowledge how things are developing in the field,” said Prof. Mel Slater, Specialty Chief Editor of Frontiers in Robotics and AI. I really like the Frontiers system, especially the interactive part, and the rapid appearance after acceptance. The Journal of “Frontiers in immunology” has provided a froum by which you can view the whole frontiers in immunology.